The first snake was small, a shade of green both dull and dark. The second was bright yellow and significantly thicker. The first slithered away at the wave of my bamboo walking stick, the second lunged into the creek before I had time to react. I want to believe that I would have behaved valiantly, perhaps employing some sort of karate technique. The truth is that I was fortunate. I have never done martial arts. I was not even to the forest and I had already encountered two snakes. Did more run-ins with wild beasts lie ahead? I decided to continue on. The manager of the resort in Laitkynsew, a small village in northeast India, had assured me the destination would be worth the two-hour hike. My endpoint was a bridge, but not just any old bridge made of stone or concrete or wooden planks. I was headed to see a wonder of natural engineering made from the roots of living trees. The trail to the bridge ran from Laitkynsew, which lies on a plateau above the plains of neighboring Bangladesh, through heavy forest. It was November. The dry-season. Nearby Cherrapuji (called Sohra, locally) touts itself as the wettest spot on earth. This makes for spectacular waterfalls during monsoon season, and for lush jungle vegetation in the hills year-round. As the woods grew thicker, so did the spiderwebs. The walking stick kept coming in handy, especially when I moved to within half-a-foot of a bright yellow-and-black spider the size of a grenade, perched right around groin level. If Spiderman had derived special powers from a spider bite to the hand, one can only imagine what may have transpired had I taken another step. I took a blurry picture before the spider, like some paparazzi-peeved celebrity, receded from view. I cleared the web and kept moving to the swelling, occasionally disconcerting, sounds of the jungle. The light shone scantly through the trees. Only a few hours of daylight remained. I began to question if I had taken the wrong way when I rounded a bend and caught first sight of the bridge. A snarl of dark, moss-covered branches bent and twisted across a little river. It was as if I had stepped into Tolkien’s Middle Earth, into a shapeshifting fantasy world. 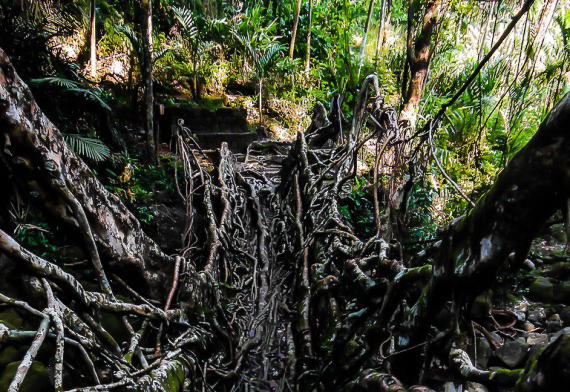 Living root bridges are created by manipulating Ficus elastica, a sly species of Indian rubber tree that produces long, sturdy roots. The trees home to the rivers created during monsoons. Over time, the War-Khasis, a tribe native to the jungles of northeast India, tired of incessantly replacing damaged and washed-out bridges and commenced training the malleable roots of rubber trees to take their place. The process takes ten to fifteen years. Between the base of a rubber tree and the opposite bank, the War-Khasi perch a hollowed-out trunk of a betel nut tree. The rootstock slowly crawls along the trunk till it spans the waterway and embeds itself in the soil. Gaps in the overpass are plugged with rocks and branches. A walking bridge is born. As I stepped onto the bridge, which came equipped with naturally grown handrails, I shifted my weight back and forth, then bounced up and down. The structure was flagstone-firm. It did not budge. I later learned that some of the bridges can hold the weight of fifty or more people at a time. The years pass and the bridges grow sturdier as the roots tunnel deeper and deeper. Some bridges in the area may have been standing for 500 years. To come across such a simple yet creative solution to an age-old problem, to come across a structure so unique to a particular place and people, it felt like the perfect coda to the five months I had spent traveling throughout southern Asia. It is one thing to learn in books about a culture foreign to your own, it is another to experience it, to take a step and feel the weight there beneath your feet. The culture of the War-Khasi people was not on display on posters or in brochures back in Laitkynsew. Perhaps that will change. Locals seem to be coming to the realization that the outside world wants to learn about the Khasi, their beliefs, their feats of engineering. There is talk of eco-tourism. Some nearby bridges are already in the process of being monetized. What Laitkynsew and the surrounding area could turn into is anyone’s guess. But at that moment in the jungle, as the sunlight faded and the wild cacophony reached full blast, I stood there and enjoyed the bridge for what it was, not for what it might become. From bank to bank the roots twisted over the river in ordered, organic chaos. It was a hundred shades of green. It was a hundred shades of brown. The bridge was alive, a living beauty. Evan Galbraith is a freelance writer based in Calgary, Canada. In 2012, he spent six months traveling through Asia.